Six soldiers stood together on a foreign land so far from home, Doing their jobs, making a difference, keeping our own homeland secure. As they climbed that mountain that November day, their fates they could have never known, Nor we at home that their laughs and voices we would sadly hear no more. Our hearts are broken, our days are long, But for our boys we must stay strong. For they are heroes, they gave their lives, and left behind mothers, fathers, children, wives. They can never be forgotten, can never be replaced, We will never truly know, the dangers that they faced. For heroes do it easily, in their own quiet way, Facing evil and personal sacrifice, each and every day. So how best to honor these men, who gave us their all, Who stood side by side, ever so proud and tall. Six soldiers on a mountain, now named Heroes Hill, Forever we have loved you, and forever we always will. Your lives have made a difference, you've done your country proud, we will not your names whisper, we'll shout them proud and loud. For freedom and love of country, you've done more than your fair parts, we will always honor your memories, and carry them in our hearts. So thank you our six soldiers, and all others brave and true, we will live our lives in honor, and learn to hide the pain, Until we make our own trips home, to be with you again. 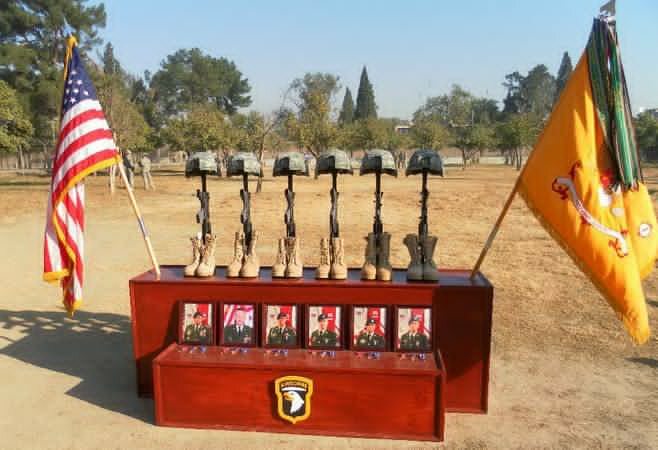 This is the memorial in Afghanistan for Austin, Curtis, and the four other soldiers killed November 29, 2010. May God bless those who gave so much in the name of freedom and our country.